The Moscow-based Group for the Study of Reactive Motion was a Soviet research bureau founded in 1931 to study various aspects of rocketry (Russian: Группа изучения реактивного движения, Gruppa izucheniya reaktivnogo dvizheniya, abbreviated ГИРД, GIRD). In 1933 it was incorporated into the Reaction-Engine Scientific Research Institute (Реактивный научно-исследовательский институт, Reaktivnyy nauchno-issledovatel’skiy institut, РНИИ, RNII). GIRD was created on September 15, 1931. There were a number of amateur groups and solitary researchers in existence, but GIRD was the world's first large professional rocketry program. The group was organized as four brigades and ten projects to study rocket engines and also winged and wingless missiles. Sergey Korolev, the future leader of the Soviet space program, was the over-all director of GIRD, as well as a brigade leader and the chairman of its technical council. Tsander had begun work on the OR-1 experimental engine in 1929 while still at the IAM; this subsequently became GIRD Project 01. It ran on compressed air and gasoline and Tsander used it to investigate high-energy fuels including powdered metals mixed with gasoline. The chamber was cooled regeneratively by air entering at the nozzle end and also by water circulating through a coil. Project 02, the OR-2 engine, was designed for Korolev's RP-1 rocket-powered glider. It burned oxygen and gasoline, and its nozzle was made from heat-resistant graphite. The engine was later modified to burn alcohol, which generated less heat than gasoline, and its thrust was increased. After cooling the engine walls, the compressed oxygen entered the top end of the chamber in a swirling pattern. Fuel was injected through an atomizer at the center, to create efficient mixing and combustion. In January 1933 Tsander began development of the GIRD-X missile. It was originally to use a metallic propellant, but after various metals had been tested without success it was designed without a metallic propellant, and was powered by the Project 10 engine which was first bench tested in March 1933. This design burned liquid oxygen and gasoline and was one of the first engines to be regeneratively cooled by the liquid oxygen, which flowed around the inner wall of the combustion chamber before entering it. Problems with burn-through during testing prompted a switch from gasoline to less energetic alcohol. The final missile, 2.2 metres (7.2 ft) long by 140 millimetres (5.5 in) in diameter, had a mass of 30 kilograms (66 lb), and it was anticipated that it could carry a 2 kilograms (4.4 lb) payload to an altitude of 5.5 kilometres (3.4 mi). 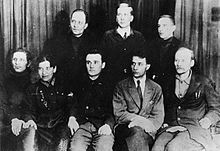 Tsander died unexpectedly from an illness on March 28, 1933, and his engineer, Leonid Konstantinovich Korneev, became the new leader of his Brigade. An exact copy of the GIRD-X can be found on Tsander's headstone in Kislovodsk. The first Soviet rocket launch was the GIRD-9, on 17 August 1933, which reached the modest altitude of 400 metres (1,300 ft). Mikhail Klavdievich Tikhonravov, who would later supervise the design of Sputnik I and the Luna programme, headed GIRD's 2nd Brigade, responsible for the Project 05 rocket in a joint effort with the Gas Dynamics Lab (GDL) in Leningrad. Project 05 used the ORM-50 engine developed by Valentin Glushko, which was fuelled by nitric acid and kerosene with its nozzle regeneratively cooled by the flow of acid. First tested in November 1933, the ORM-50 predated Eugen Sänger's regeneratively cooled engine, which was not tested in Austria until May 1934. The 05 rocket contained four long tanks, enclosed in a body with a four-lobed cross section. It was never completed, but its design formed the basis of the later Aviavnito rocket, powered by Leonid Dushkin's 12-K engine and fueled by liquid oxygen and alcohol, which was first launched in 1936 and achieved an altitude of 3,000 m (9,800 ft) in 1937. On 16 May 1932 Mikhail Tukhachevsky filed a memorandum to the effect that GIRD and the State Gas Dynamics Laboratory (GDL) of Leningrad should be combined, and the result was the Reaction-Engine Scientific Research Institute (RNII), founded on 21 September 1933. ^ a b Albrecht, Ulrich (1993). The Soviet Armaments Industry. Routledge. pp. 74–75. ISBN 3-7186-5313-3. This page was last edited on 18 April 2018, at 23:48 (UTC).